This article is about the actor. For the poet, see Peter Finch (poet). Frederick George Peter Ingle Finch (28 September 1916 – 14 January 1977) was an English-Australian actor. He is best remembered for his role as crazed television anchorman Howard Beale in the film Network, which earned him a posthumous Academy Award for Best Actor, his fifth Best Actor award from the British Academy of Film and Television Arts, and a Best Actor award from the Golden Globes. HFinch was the first of two persons to win a posthumous Academy Award in an acting category, both of whom were coincidentally Australian, the other being Heath Ledger. 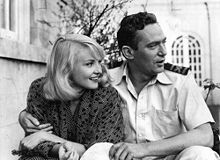 Finch was born as Frederick George Peter Ingle Finch in London to Alicia Gladys Fisher. At the time, Alicia was married to George Finch. George Finch was born in New South Wales, Australia, but was educated in Paris and Zürich. He was a research chemist when he moved to Britain in 1912 and later served during the First World War with the Royal Army Ordnance Depot and the Royal Field Artillery. In 1915, at Portsmouth, Hampshire, George married Alicia Fisher, the daughter of a Kent barrister. However, George Finch was not Peter Finch's biological father. He learned only in his mid-40s that his biological father was Wentworth Edward Dallas "Jock" Campbell, an Indian Army officer, whose adultery with Finch's mother was the cause of George and Alicia's divorce, when Peter was two years old. Alicia Finch married Jock Campbell in 1922. George gained custody of Peter, who was taken from his biological mother and brought up by his adoptive paternal grandmother, Laura Finch (formerly Black) in Vaucresson, France. In 1925 Laura took Peter with her to Adyar, a theosophical community near Madras, India, for a number of months, and the young boy lived for a time in a Buddhist monastery. Undoubtedly, as a result of his childhood contact with Buddhism, Finch always claimed to be a Buddhist. He is reported to have said: "I think a man dying on a cross is a ghastly symbol for a religion. And I think a man sitting under a bo tree and becoming enlightened is a beautiful one." In 1926 he was sent to Australia to live with his great-uncle Edward Herbert Finch at Greenwich Point in Sydney. He attended the local school until 1929, then North Sydney Intermediate High School for three years. A school friend was RAF pilot and author Paul Brickhill. After graduating, Finch went to work as a copy boy for the Sydney Sun and began writing. However he was more interested in acting, and in late 1933 appeared in a play, Caprice, at the Repertory Theatre. In 1934–35 he appeared in a number of productions for Doris Fitton at the Savoy Theatre, some with a young Sumner Locke Elliott. He also worked as a sideshow spruiker at the Sydney Royal Easter Show, in vaudeville with Joe Cody and as a foil to American comedian Bert le Blanc. At age 19 Finch toured Australia with George Sorlie's travelling troupe. He did radio acting work with Hugh Denison's BSA Players (for Broadcasting Service Association, later to become Macquarie Players). He came to the attention of Australian Broadcasting Commission radio drama producer Lawrence H. Cecil, who was to act as his coach and mentor throughout 1939 and 1940. He was "Chris" in the Children's Session and the first Muddle-Headed Wombat. He later starred with Neva Carr Glyn in an enormously popular series by Max Afford as husband-and-wife detectives Jeffery and Elizabeth Blackburn as well as other ABC radio plays. Finch's first screen performance was in the short film The Magic Shoes (1935), an adaptation of the Cinderella fairy tale, where Finch played Prince Charming. He made his feature film debut in Dad and Dave Come to Town (1938), playing a small comic role for director Ken G. Hall. His performance was well received and Hall subsequently cast Finch in a larger role in Mr. Chedworth Steps Out (1939), supporting Cecil Kellaway. Finch appeared in a war propaganda film, The Power and the Glory (1941), playing a fifth columnist. Finch enlisted in the Australian Army on 2 June 1941. He served in the Middle East and was an anti-aircraft gunner during the Bombing of Darwin. During his war service Finch was given leave to act in radio, theatre and film. He appeared in a number of propaganda shorts, including Another Threshold (1942), These Stars Are Mine (1943), While There is Still Time (1943) and South West Pacific (1943), the latter for Ken G. Hall. He also appeared in two of the few Australian feature films made during the war, The Rats of Tobruk (1944) and the less distinguished Red Sky at Morning (1944). Finch produced and performed Army Concert Party work, and in 1945 toured bases and hospitals with two Terence Rattigan plays he directed, French Without Tears and While the Sun Shines. He narrated the widely seen documentaries Jungle Patrol (1944) and Sons of the Anzacs (1945). Finch was discharged from the army on 31 October 1945 at the rank of sergeant. After the war, Finch continued to work extensively in radio and established himself as Australia's leading actor in that medium, winning Macquarie Awards for best actor in 1946 and 1947. He also worked as a compere, producer and writer. In 1946, Finch co-founded the Mercury Theatre Company, which put on a number of productions in Sydney over the next few years (initially in the diminutive St James' Hall), as well as running a theatre school. Finch continued to appear in the (rare) Australian feature films made around this time including A Son is Born (1946) and Eureka Stockade (1949). He was a leading contender to play Sir Charles Kingsford-Smith in Smithy (1946) but lost out to Ron Randell. Finch was also involved in some documentaries, narrating the legendary Indonesia Calling (1946) and helping make Primitive Peoples about the people of Arnhem Land. Laurence Olivier and Vivien Leigh toured Australia in 1948 with the Old Vic Company. They attended the Mercury production of The Imaginary Invalid on the factory floor of O'Brien's Glass Factory starring Finch. Olivier was impressed with Finch's acting and encouraged him to move to London, his birthplace. He left Australia for good in 1948. When Finch arrived in Britain, Olivier became his mentor and put him under long-term contract. His first big break was being cast in James Bridie's play Daphne Laureola at the Old Vic supporting Edith Evans. This was a significant critical and commercial success and established Finch in London immediately. He was soon cast in his first British movie, playing a murderous actor in Train of Events (1949). Critic C. A. Lejeune praised his work in the London Observer commenting that he "adds good cheekbones to a quick intelligence and is likely to become a cult, I fear." The Scotsman said "he should be regarded as one of the most hopeful recruits to the British screen." He had a small role as an Australian prisoner of war in The Wooden Horse (1950), the third most popular film at the British box office in 1950. His performance as a Pole in Daphne Laureola led to his casting as a Polish soldier in The Miniver Story, the sequel to the wartime morale boosting film Mrs. Miniver; unlike its predecessor, it was poorly received critically. During this time, Finch continued to appear on stage in various productions while under contract to Olivier. Finch's closeness to the Olivier family led to an affair with Olivier's beautiful but increasingly unstable wife, Vivien Leigh, which began in 1948, and continued on and off for several years, ultimately falling apart due to her deteriorating mental condition. Finch played Iago onstage in 1951 opposite Orson Welles as the lead in Othello. In 1952 he performed at St James's Theatre, King Street, London, in Sir Laurence Olivier's and Gilbert Miller's The Happy Time a comedy by Samuel Taylor. He played the part of Papa. Despite his stage experience, Finch, like his mentor Olivier, had stage fright, and as the 1950s progressed he worked increasingly in film. Finch's film roles increased in size and prestige through the early 1950s. For Walt Disney he played the Sheriff of Nottingham in The Story of Robin Hood and His Merrie Men (1952). He was given two good roles in films from Alexander Korda: as Richard D'Oyly Carte in The Story of Gilbert and Sullivan (1953), and as a priest in The Heart of the Matter (1953), from the Graham Greene novel. Then he had one of his best film parts, being cast as the villain Flambeau in Father Brown (1954), opposite Alec Guinness in the title role. He also narrated a documentary The Queen in Australia. In 1953 he appeared in his first Hollywood movie, Elephant Walk (1954), shot in Ceylon and Los Angeles. The circumstances of production were turbulent; filming started with Vivien Leigh in the lead but she had a nervous breakdown during production and had to be replaced by Elizabeth Taylor. The experience helped sour Finch on a Hollywood career and he would only work occasionally there for the rest of his career. On his return to England, Finch played another villain, in the medieval swashbuckler The Dark Avenger (1955), opposite Errol Flynn. Towards the end of 1954 Finch's contract with Laurence Olivier was about to expire and he instead signed a seven-year contract with the Rank Organisation worth £87,500 to make one film a year for them. "We are going to build Peter into a major British star", said Earl St. John, Rank's head of production, at the time. Finch's first roles for Rank under the new arrangement gave him star parts but were, on the whole, undistinguished: Make Me an Offer (1954), Simon and Laura (also 1954), Josephine and Men (1955), and Passage Home (also 1955). However, he was then cast as an Australian soldier in A Town Like Alice (1956), which became the third most popular film at the British box office in 1956 and won Finch a BAFTA for Best Actor. He followed it with The Battle of the River Plate (1956), playing Captain Hans Langsdorff. This was also successful financially and British exhibitors voted Finch the seventh most popular British star at the box office for 1956. Finch returned to Australia to make The Shiralee (1957), one of his favourite parts, and the tenth most popular movie at the British box office that year. He followed it with another Australian story, the bushranger tale Robbery Under Arms (1957), which did less well. However exhibitors still voted Finch the third most popular British star of 1957, and the fifth most popular overall, regardless of nationality. His next two films for Rank were not particularly successful: Windom's Way (1957), where he played a doctor caught up in the Malayan Emergency, and Operation Amsterdam (1959), a war time diamond thriller. Finch's career received a boost when Fred Zinnemann cast him opposite Audrey Hepburn in The Nun's Story (1959). This was an enormous financial and critical success and established Finch's reputation internationally. For Disney he played Alan Breck in a version of Kidnapped (1960). He then received great acclaim for his performance as Oscar Wilde in The Trials of Oscar Wilde (1960), winning another BAFTA; the film however was not popular. Finch co-wrote and directed an award-winning short film, The Day (1960) and announced plans to direct a feature but it did not eventuate. He won his third BAFTA for Best Actor for No Love for Johnnie (1961), although like Oscar Wilde, the film lost money. He was originally chosen to play Julius Caesar in Cleopatra (1963) and filmed scenes in London, but when the film was postponed he withdrew; the role was recast with Rex Harrison. Finch made a series of unsuccessful Hollywood films: The Sins of Rachel Cade (1961), an attempt to repeat the success of The Nun's Story, with Angie Dickinson; then two for director Robert Stevens at MGM: I Thank a Fool (1962) and In the Cool of the Day (1963). Finch restored his critical reputation with two highly acclaimed British films: The Pumpkin Eater (1964) and Girl with Green Eyes (1964). He had an uncredited cameo in First Men in the Moon (1964), then had a good role in tough adventure film for Robert Aldrich, The Flight of the Phoenix (1965). Finch's next three films saw him support notable female stars: Sophia Loren in Judith (1966), Melina Mercouri in 10:30 P.M. Summer (1966) and Julie Christie in Far from the Madding Crowd (1967). He was reunited with Aldrich for The Legend of Lylah Clare (1968). The Red Tent (1970) was an expensive international adventure film, with Finch as Umberto Nobile. Finch's career received another boost when Ian Bannen dropped out of the lead in Sunday Bloody Sunday (1971). Finch replaced him and his performance was rewarded with another BAFTA for Best Actor and an Oscar Nomination. The momentum of this was lost somewhat by Something to Hide (1972) and the disastrous musical remake of Lost Horizon (1973). He played Lord Nelson in Bequest to the Nation (1973) and an opportunistic financier in England Made Me (1973). The Abdication (1974) was an unsuccessful historical drama. Finch was asked if he wanted to audition for the part of news presenter Howard Beale in Network (1976), written by Paddy Chayefsky and directed by Sidney Lumet. The audition was successful and Finch played the role. The movie was his biggest commercial and critical hit in years. He then played Yitzhak Rabin in Raid on Entebbe (1977). Shortly after Raid on Entebbe finished shooting, Finch undertook a promotional tour for Network. On 13 January 1977 he appeared on The Tonight Show Starring Johnny Carson. The day after, he had a heart attack in the lobby of the Beverly Hills Hotel and died at the age of 60. He is interred in the Hollywood Forever Cemetery. Finch was nominated for an Oscar for Network and went on to posthumously win the award, which was accepted by his widow, Eletha Finch. Although James Dean, Spencer Tracy and Massimo Troisi were also posthumously nominated for a Best Actor Oscar, Finch was the first actor to have won the award posthumously, as well as the first Australian actor to win a Best Actor award. He was the only posthumous winner of an Oscar in an acting category until fellow Australian Heath Ledger won the Academy Award for Best Supporting Actor in 2009; there were many earlier posthumous Oscar winners in non-acting categories. Finch also won five Best Actor awards from the British Academy of Film and Television Arts (BAFTA), including one for Network. We all say we're going to quit occasionally. I'd like to have been more adventurous in my career. But it's a fascinating and not ignoble profession. No one lives more lives than the actor. Movie making is like geometry and I hated maths. But this kind of jigsaw I relish. When I played Lord Nelson I worked the poop deck in his uniform. I got extraordinary shivers. Sometimes I felt like I was staring at my own coffin. I touched that character. There lies the madness. You can't fake it. Finch was married three times. In 1943, he married Romanian-born French ballerina Tamara Tchinarova; they worked together on a number of films. They had a daughter, Anita, born in 1950. They divorced in 1959, after she discovered his affair with actress Vivien Leigh in California. He then married South African-born actress Yolande Turner (née Yolande Eileen Turnbull); they had two children together, Samantha and Charles Peter. During their marriage, Finch had an affair with the singer Shirley Bassey. Bassey had a daughter, also named Samantha, born in 1963; Bassey's husband at the time, the openly gay film producer Kenneth Hume, believed that Finch was her biological father. Finch and Turner divorced in 1965. In 1972 Finch married Mavis "Eletha" Barrett, who was known as Eletha Finch. They had a daughter together, Diana. In 1954, the Australian journalist and author George Johnston wrote a well-researched series of biographical articles on Finch, his life, and his work, which appeared in the Sydney Sun-Herald on four consecutive Sundays, which were certainly the first detailed account of Finch's life to be published. Finch later provided the inspiration for the character Archie Calverton in Johnston's novel, Clean Straw for Nothing. In 1980, American author Elaine Dundy published a biography of Finch titled Finch, Bloody Finch: A Biography of Peter Finch. That year, his second wife, Yolande Finch, also published a posthumous account of their life together, Finchy: My Life with Peter Finch. Another biography had previously been published by his friend and colleague Trader Faulkner, in 1979. According to an entry in Brian McFarlane's The Encyclopedia of British Film, republished on the British Film Institute's Screenonline website, Finch "did not emerge unscathed from a life of well-publicised hell-raising, and several biographies chronicle the affairs and the booze, but a serious appraisal of a great actor remains to be written." A profile of Finch on the British Film Institute's Screenonline website asserts that "it is arguable that no other actor ever chalked up such a rewarding CV in British films." 1935 The Magic Shoes Prince Charming A short film, now considered lost, although some stills exist at Australia's National Film and Sound Archive. 1938 Dad and Dave Come to Town Bill Ryan Finch only has one scene of note, acting opposite Bert Bailey. A copy of the scene is available at Australian Screen Online. 1941 While There is Still Time Jim A propaganda short film made for the Australian government during the Second World War. 1942 Another Threshold A propaganda short film made for the Australian government during the Second World War. 1943 South West Pacific RAAF pilot A propaganda short film made for the Australian government during the Second World War. Jungle Patrol Narrator Documentary made for the Australian government during the Second World War. 1945 Sons of the Anzacs Narrator Documentary about the Australian army during World War II. 1948 Red Sky at Morning Michael This is considered a lost film. 1954 Elephant Walk John Wiley First Hollywood film. He was originally to co-star with Vivien Leigh but she had a nervous breakdown and was replaced by Elizabeth Taylor. The Dark Avenger Comte De Ville He stars opposite fellow Australian Errol Flynn. 1960 The Day Co-wrote and directed award-winning short film. Silver Bear for Best Actor at the 11th Berlin International Film Festival. First Men in the Moon Bailiff's man Finch plays an uncredited cameo in this film. He was visiting the set when the actor who was supposed to play the part failed to show up. False Colours by Frank Harvey – Independent Theatre, Sydney, 1935. Under the Big Top – touring show with George Sorlie, various Queensland towns, 1936, playing Herbert Hughes in Laughter of Fools by H.F. Maltby, Smithers in Married by Proxy by Avery Hopwood, Peter in Fair and Warmer by Avery Hopwood, Hunter in Ten Minute Alibi by William Armstrong – all directed by William McGowan with Murray Matheson, Rosalind Kennerdale, Leslie Crane, Eva Moss, Norman French, Julia Adair and George Douglas. The Seagull by Anton Chekhov translated by Ann Jellicoe, as Trigorin – Queen's Theatre, London, 1964 – directed by Tony Richardson with Peggy Ashcroft, Peter McEnery, Vanessa Redgrave, Paul Rogers and George Devine. ^ Obituary Variety, 19 January 1977, p. 94. ^ a b c d e f g "Finch, Frederick George Peter Ingle (1916–1977)". Australian Dictionary of Biography Online Edition. Retrieved 27 July 2008. ^ Some sources say that Finch's real name was William Mitchell, but there are no records that substantiate this, and it appears to be an urban myth. ^ "Index entry". FreeBMD. ONS. Retrieved 6 May 2011. ^ Peter Finch at AllMovie. ^ "Peter Finch". AllMovie. Retrieved 27 July 2008. ^ "Peter Finch – Actors and Actresses". ^ "The Repertory Theatre". The Sydney Morning Herald. 16 December 1933. p. 8. Retrieved 11 February 2012 – via National Library of Australia. ^ Bert le Blanc's real name Bertram Leon Cohn (1889-1974) (National Archives of Australia); and Cohn was widely known as either "the Jew Comedian" () or "the Hebrew comedian" (). ^ a b "World War Two Nominal Roll". ^ "18 Aug 1949 – The Social Round of Events in Sydney Yesterday". Trove. ^ "Finch, In Films, Plays A Zestful Strangler". The Sunday Herald. Sydney. 10 April 1949. p. 8 Supplement: Magazine. Retrieved 12 February 2012 – via National Library of Australia. ^ "International Manners", Lejeune, C. A. The Observer [London] 21 Aug 1949: 6. ^ "Train of Events": "Star" from Platform 13 The Scotsman [Edinburgh, Scotland] 22 Aug 1949: 6. ^ a b Richard Brooks (7 August 2005). "Olivier Worn Out by Love and Lust of Vivien Leigh". The Sunday Times. timesonline.co.uk. Retrieved 27 July 2008. ^ From an original theatre programme, printer's date 30 January 1952. ^ "Peter Finch Wins £87,500 Contract". The Sydney Morning Herald. 20 November 1954. p. 3. Retrieved 11 February 2012 – via National Library of Australia. ^ "The Most Popular Film Star in Britain." The Times (London) 7 December 1956: 3. The Times Digital Archive. Web. 11 July 2012. ^ "British Actors Head Film Poll: Box-Office Survey", the Manchester Guardian (1901–1959) (Manchester) 27 December 1957: 3. ^ "'Slumdog Millionaire' fulfills its Oscar destiny". TODAY.com. ^ Artsvi Bakhchinyan (2012). Внучка армянского помещика, соперница Вивьен Ли, переводчица балетных звезд [Granddaughter of an Armenian landowner; rival of Vivien Leigh, interpreter to ballet stars]. Inie Berega (in Russian). Retrieved 21 March 2015. ^ Paul Donnelley (2003). Fade to Black: A Book of Movie Obituaries. Music Sales Group. p. 240. ISBN 978-1-84938-246-5. ^ a b Dancing into the Unknown, Tamara Tchinarova Finch, 2007; ISBN 978-1-85273-114-4; accessed 20 August 2014. ^ "No title". The Sydney Morning Herald. 28 April 1941. p. 4. Retrieved 11 February 2012 – via National Library of Australia. ^ "From George, With Sadness". The Australian Women's Weekly. 27 August 1969. p. 13. Retrieved 10 February 2012 – via National Library of Australia. ^ Finch, Peter (1916–1977) at the BFI's Screenonline. (N.B. : Miscalculates age at time of death as 61, not 60.). ^ "BFI Screenonline: Finch, Peter (1916-1977) Biography". ^ ""Sons of the Anzacs"". The Mercury. Hobart, Tas. 10 February 1945. p. 9. Retrieved 11 February 2012 – via National Library of Australia. ^ "2nd Moscow International Film Festival (1961)". MIFF. Archived from the original on 16 January 2013. Retrieved 2012-11-04. ^ "Berlinale 1961: Prize Winners". berlinale.de. Retrieved 23 January 2010. ^ "K.C.s as Jurors in New Play". The Sydney Morning Herald. 20 June 1944. p. 5. Retrieved 11 February 2012 – via National Library of Australia. ^ "Music and Drama The Flying Emus". The Sydney Morning Herald. 18 November 1944. p. 8. Retrieved 11 February 2012 – via National Library of Australia. ^ "Rattigan Play Presented". The Sydney Morning Herald. 25 September 1947. p. 7. Retrieved 11 February 2012 – via National Library of Australia. ^ THE THEATRES: LYCEUM: "French Without Tears" The Scotsman [Edinburgh, Scotland] 04 Apr 1950: 4. ^ OPERA HOUSE: "Captain Carvallo" The Manchester Guardian 27 June 1950: 5. ^ "Soldier-Poet In Portrayal; Climax Misses: Friendly Smile Australian Iago" by Harold Hobson. The Christian Science Monitor [Boston, Massachusetts] 27 October 1951: 10. ^ "Talking off the Cuff" Williams, W. E. The Observer [London] 16 October 1949: 6. ^ "Leading artists heard in famous plays". The Australian Women's Weekly. 25 March 1939. p. 46. Retrieved 11 February 2012 – via National Library of Australia. ^ "Iron Lung Inventor at 5 AD Tomorrow". The Advertiser. Adelaide. 1 April 1939. p. 27. Retrieved 11 February 2012 – via National Library of Australia. ^ "Broadcasting". The Sydney Morning Herald. 7 June 1939. p. 7. Retrieved 11 February 2012 – via National Library of Australia. ^ "Night Nurse". The Argus. Melbourne. 24 June 1939. p. 2. Retrieved 11 February 2012 – via National Library of Australia. ^ "New popularity for old-time plays". The Australian Women's Weekly. 15 February 1941. p. 43. Retrieved 11 February 2012 – via National Library of Australia. ^ "Melba Memorial Concert". The Advertiser. Adelaide. 17 May 1941. p. 17. Retrieved 11 February 2012 – via National Library of Australia. ^ "Radio Acting Awards". The Sydney Morning Herald. 14 April 1947. p. 5. Retrieved 11 February 2012 – via National Library of Australia. ^ "Acting Awards". The Sydney Morning Herald. 8 March 1948. p. 2. Retrieved 11 February 2012 – via National Library of Australia. ^ "This Weeks's Radio Features". The Advertiser. Adelaide. 30 March 1946. p. 7. Retrieved 11 February 2012 – via National Library of Australia. ^ "5 AD's 'Big Sister' Ends Tonight". The Advertiser. Adelaide. 17 August 1946. p. 13. Retrieved 11 February 2012 – via National Library of Australia. ^ "A.B.C. to Open New Station; Thebarton Match From 5 AD". The Advertiser. Adelaide. 24 July 1948. p. 7. Retrieved 11 February 2012 – via National Library of Australia. Dundy, Elaine. Finch, Bloody Finch: A Biography of Peter Finch. New York: Holt, Rinehart & Winston, 1980. ISBN 0-03-041796-1 (10). ISBN 978-0-03-041796-2 (13). Faulkner, Trader. Peter Finch: A Biography. London: Angus & Robertson, 1979. ISBN 0-207-95831-9 (10). ISBN 978-0-207-95831-1 (13). Finch, Yolande. Finchy: My Life with Peter Finch. London: Arrow Books, 1980. ISBN 0-09-924190-0 (10). ISBN 978-0-09-924190-4 (13). 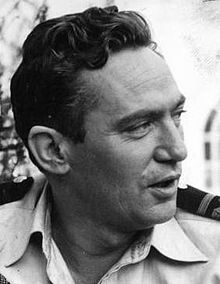 Wikimedia Commons has media related to Peter Finch. Peter Finch media holdings[permanent dead link] at the National Film and Sound Archive of Australia.